However, I'm still alive. And kicking. And my computer, thank blog, is still in one piece with no dents in it. And my sons have just disowned me. But I'm happy to say that making a buttery, cheesy, rich and delicate pastry within 4 degrees latitude of the equator in a stuffy kitchen in the middle of a blazing afternoon is not quite as insane as aligning 3 miserable photographs on a laptop that is as slow as it takes me to comprehend Photoshop. So it shouldn't surprise you that I have successfully made the pastry (in spite of) and there are now 4 mini apple pies for only 4 of the people in this household who are the only ones who like apple pies. Me included. We are especially crazy about the pie crust which explains why I was mad enough to make it. It's the best apple pie crust in the world. Because it is the apple pie crust from the 'Pie and Pastry Bible' by Rose Levy Beranbaum. And any recipe of hers is worth it's weight in crust and calories. Place a medium sized bowl in the freezer to chill. Cut butter in 3/4 inch cubes. Wrap and chill for 30 minutes. Place flour, salt and baking powder into a bowl.Cut in the cream cheese until the mixture becomes a coarse meal. Spoon the mixture and the cold cubed butter into a ziploc bag (I used a big plastic bag and held on to the end). Expel air, close and using a rolling pin flatten the butter into thin flakes (first picture below). Once done put the bag of flour mixture into the freezer till firm. About 10 minutes. Then transfer the mixture to a chilled bowl. Sprinkle water and vinegar, tossing lightly (second picture above). Divide in to 2 portions and put each portion into a ziploc bag each. 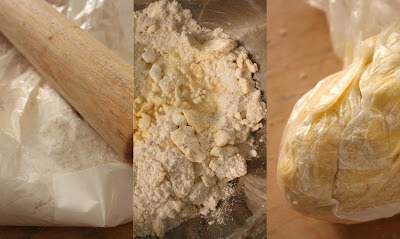 Holding the opening, knead until the dough holds together (as in the third picture above) and is slightly stretchy when pulled. Wrap and flatten into discs. Refrigerate at least 45 minutes or preferably overnight. Here's the recipe for the pie filling..
(I cooked my apples in its juices instead of going by Rose's uncooked version because I am not particularly keen on half raw apples in my apple pie). However the following is Rose's recipe..
Before making th epie filling, roll out one half of the pastry and line a pie pan. Wrap and refrigerate for at least 30 minutes or up to 3 hours. Macerate apples with lemon juice, brown sugar, white sugar, cinnamon, nutmeg and salt for between 30 minutes to 3 hours.Then transfer to a colander and collect the juices. Boil down the juice to between 1/2 and 1/3 cup with teh butter. Toss the apples and the cornstarch until there are no more traces of the cornstarch. Pour the syrup (boiled juice) over apples. Roll out top crust ready to cover the pie. Fill the lined pie pan with the apple pie filling, brush edges with a little egg yolk and then cover with the top sheet of pastry. Trim teh edges, crimp the edges, make 3 slashes on the top pastry. Brush the top with water/milk/egg yolk/egg white. Refrigerate 1 hour. I made 4 small pies (4 inches across) this afternoon and had some pastry and filling left over for tomorrow. Probably for another 3 pies. Bake 45-55 minutes in 435 F oven. Cool 4 hours before serving. Oh, I'm terrible with lattice top so I always leave my whole apple pie top covered with pastry. I noticed cider vinegar in the pastry ingredients, what is that for ? I came across your blog whilst searching the net for laksa recipes. I liked yours for its association with Ellice Handy-the name instantly took my back to my mother's copy of Mrs Handy's cookbook. I knew I wouldn't go wrong. Thanks for blogging about noodles. I'm something of a noodle addict-am now going to research the topic and hope that regulations in Australia are a little more strict on ingredients such as lye water and boric acid! Great blog, I admire your drive for making pastry in humid conditions and paying a small fortune for things like yoghurt. Keep up the great work and I'm sure I'll be back to visit. LOL, funny! I'm not proficient at photoshop and so I don't even try to mess with it. Kudos to you for sticking with it. That crust does sound amazing.